Does Your Mature Yard Need Landscape Grading? Landscape grading involves leveling a large piece of land so the landscape can serve a better purpose. For example, grading is done before gardens are planted, before houses or other structures are built, or before sod or seed is planted in a yard. 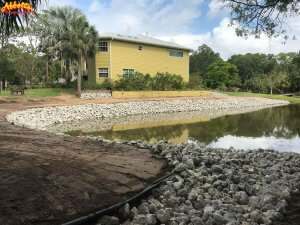 The goal of grading is to create an optimum slope on a foundation to both look attractive and keep groundwater from ruining a structure’s foundation. Your home’s property was likely graded before you moved in, but sometimes a mature yard needs to be graded again. Does your landscape need grading? How can you tell? Use this guide to assist you in your landscape solutions. A main sign you need landscape grading on your mature land is the way water flows away from your home. If your house is built on a slope where the land has been graded properly, water will naturally drain away from your home. If your slope is not graded at enough of an angle, water will pool around your property, causing water runoff to seep into your home’s foundation — and eventually into your home itself. Call your landscaper for grading before your water problems continue. Your home’s bottom level should not be flush with your yard; there should be several inches of space between your home’s base and the grass growing in your yard. Grab a measuring tape and record the length of space between your home’s base and the start of soil or grass. Odds are, if your mature lawn needs leveling, you will see a few scant inches of space dividing the cement foundation from your lawn in some areas, and several inches in others. Your home should not be level with the ground; the closer your home’s foundation is to the soil that surrounds it, the more likely your home is to flood or become too exposed to excess water runoff. If your home is too level to the ground, report your findings to your landscaper and arrange to have your landscape graded. Perhaps your lawn was poorly graded long before you owned your property, or previous owners added onto the landscape and did their grading project on their own. Since grading a landscape involves a lot of math and fine details, even the smallest mistake can lead to too much soil in one area and way too steep of a slope in another. An uneven lawn is hard to water and maintain, not to mention potentially unattractive when it comes to curb appeal. The grading process involves placing soil and dirt in areas that need to be filled and removing excess dirt in other parts of your lawn for an even, enjoyable yard. Your landscaper will use a level to measure the slope on all areas of your yard and will help restore your landscape so it can grow lush and even. Do not grade your lawn yourself — uneven grading done unprofessionally will eventually worsen, causing your home’s property to need grading yet again. It’s not uncommon for a property to need grading even if the existing landscape is mature. Your job as a homeowner is to recognize when your home’s landscape needs to be graded so you can protect your home’s foundation. Call Abbott’s Construction for all your property’s grading needs. Our professional approach will have your landscape looking better than ever, and your home’s foundation will be better protected as well.